My blonde Jenny (1986) shown above has the twist 'n turn waist, her legs feel like Barbie's bend leg dolls, but they do not click and hold a pose, and she has the same beautiful hair in the back as the American twist n' turn Barbie from 1967. She comes in an amazing Kimono with her traditional slippers and her matching bag. My sister-n-law brought her back for me when she was in Japan in the 1980's. There are over 50 different girls and boys in the Jenny line which are available with various hair, eye, and skin colors. Takara Excelina Barbie Doll 1985 The Excelina Barbie Doll was dressed in more elaborate clothes. As her box says: High Quality Fashion doll" and "High Grade Barbie Dress Collection" These dolls are harder to aquire. The Takara Barbie Convention Doll was given to 250 people who attended the "Around the World Barbie Festival" which was held in Romulus Michigan, July 1985. As a footnote, the very first Barbie convention was held in New York City in 1980. 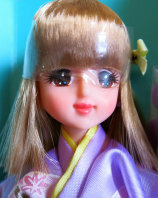 The Takara Barbie was manufactured in several different styles between 1982 and 1985. There was the beautiful “Excelina Barbie Doll”, who was dressed in more extravagant clothes. She was considered a “High Quality Fashion doll" with a "High Grade Barbie Dress Collection" as her doll box states. These dolls are harder to find and you are likely to pay a higher price for them. Other new releases in Japan included the “Kimono Collection”. These dolls were dressed in traditional kimono attire. The popular casually dressed dolls from the “Casual City Girl” collection, the Candy Pop Collection, and the “Fruit Kiss dolls” were very popular. They were just so cute! There was a sporty summertime collection which was named the “Sun Shower Barbie”. There was the beautifully dressed “Crystal collection” and “Dream Party Collection”. Little girls in Japan now had a wonderful selection of Barbie dolls to choose from. Her fashions that were sold separately also provided many choices. She had simple outfits, school uniforms, everyday western style clothes, beautiful kimonos and cutting edge fashions. Some of the collections were named: “Candy Pop”, “Fur Dress Collection”, “Excelina Collection”, and “Dress Collection”. She even had Pak items, which were packaged individual items that were sold at a less expensive price. In her box she came with a clear plastic stand, a pamphlet showing other Takara dolls and fashions, and of course the blonde Takara Barbie doll. Ranze is the brunette version of the Takara Barbie. She had long black straight hair with dark eyes. She came dressed in a lace and satin style dress which was available in several different colors. Ranze was named after a popular character in the Japanese comic strip “Tokimeki Tonight”. Takara even pictured the comic character on their Takara Ranze box. She is a tremendously hard doll to find on the secondary market. Also available during this time period was the Takara Ken doll. He had the rounder face and eyes with rooted hair, just like Takara Barbie and Ranze. He came dressed in several different fashions and had clothes that were sold separately for him as well. The only Takara Barbie doll that was available in the U.S. was the Barbie convention doll. She was given to the 250 people who attended the “Around the World Barbie Festival”, which was held in Romulus, Michigan in July 1985. By early 1986 Takara Company changed Barbie’s name to Jenny, since the Takara Company wasn't licensed with Mattel to use the Barbie name anymore. Takara Ken’s name was changed to Jeff. These dolls were still produced with the same high quality as the older version Barbie dolls. Only the packaging was changed to reflect the new names. The early Takara Barbie, Ken, and Ranze dolls are highly sought after and can be very hard to find. The Takara Barbie was released in 1982, when Mattel teamed up with Takara Company to develop a fashion doll. At the time Barbie had been in the Japanese market for quite some time, but she wasn’t that popular with the girls there. With a few key changes made by Mattel and Takara, they had what they needed to boost sales in the Japanese market. The new Takara Barbie was extremely popular. Takara Barbie stood 10 1/2 inches tall, which is just a bit shorter than the standard Barbie who stands at 11 1/2 inches tall. The Takara Barbie had a "smaller, not so voluptuous" figure, with rounder eyes and a rounder face. Her figure was more like that of Francie, Twiggy and Casey. She was fashioned after Agnes Lam, who was a popular model and actress in Japan in the late 1970's. Takara Ranze who was named after a Japanese comic strip "Tokimeki Tonight". (Shown above) with a portion of the 30 volume set of her popular comic books. Fashions and Furniture Click Here! Takara Barbie Mink with a real mink coat.